I usually have been fairly straight ahead when I photograph. I like standing at my own height, not stooping or bending, basically looking at the world from eye level. It has suited me for 50+ years, but here I was in Il Campo, the vast piazza in Siena, a place I love to go to. It’s a fan shaped piazza that is made of old bricks and it slopes downhill making it a great place for people to lie down in and take the sun, or just hang out. So imagine my surprise when I opened my eyes and saw the tower from this position. Instead of rolling over and becoming right side up I decided to experience the dislocation and see what making a photograph like this felt, and looked like. 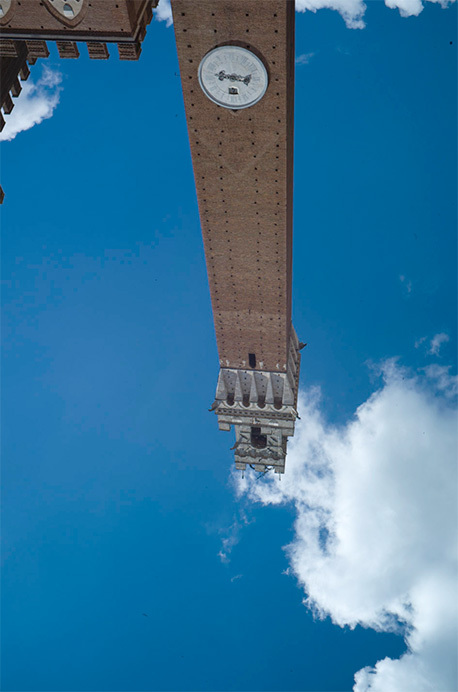 This entry was posted in Siena and tagged Siena, Tuscany on June 4, 2015 by joelmeyerowitz2014.